Somewhere up in the culinary expansiveness of the northeastern Italian countryside where Italy begins to edge toward Austria and Switzerland and cultures and languages co-mingle, there are quiet sighs of pleasure because of an astonishing apple pastry. The world is full of lots of incredible apple cakes. Some are plugged with spice or rum, some are fortified with toasted nuts or glaze. Others are simple and rustic and so purely delicious they elicit your full attention. This is that kind of cake. The genesis of this pastry begins in the Province of Bolzano-Bozen in the Trentino-Alto Adige region of Italy. Scott Carsberg, chef at Seattle’s renowned Lampreia, trained in the region and features this creation on his menu. Even if you think you’ve had some really great Italian desserts, this apple configuration is one of those pastries that you will likely forever think about only with a kind of sacred longing. 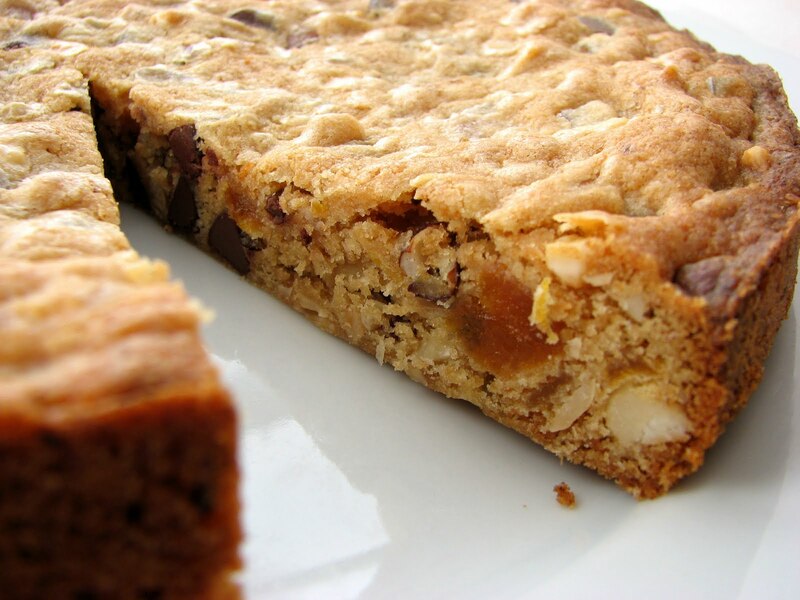 Actually, the first thing I should say about Bolzano Apple Cake is that it is actually not a cake. It is at once a truly simple and yet mysterious thing, composed mostly of really wonderful vanilla-scented apples that are baked to mind-numbing perfection. There is a batter of sorts that barely binds the whole luscious thing together but it’s made mostly of butter, a couple of eggs, some sugar and just the sparest cascade of flour. 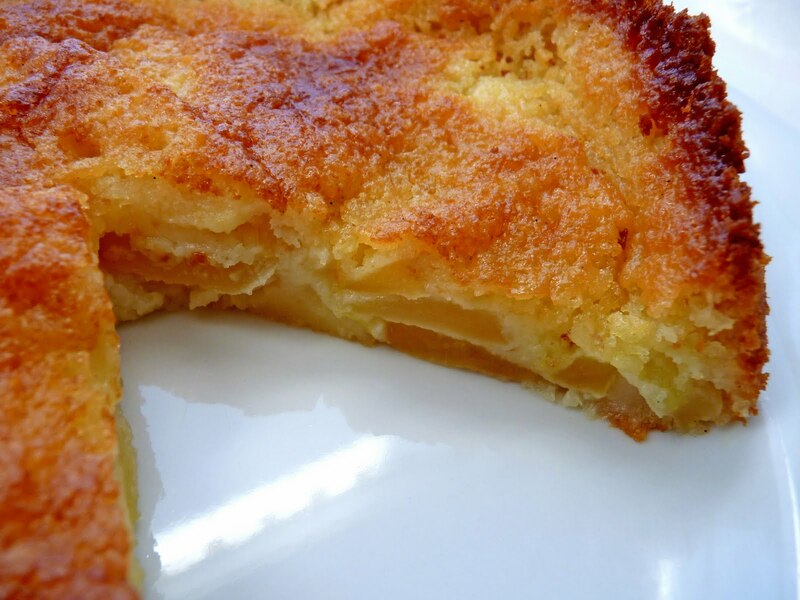 The edges become caramelized and crunchy and the center is like an endless dreamy delicate applescape. The texture is not strictly cakey and it’s not like a custard. It almost has the mouthfeel of moist crepes but only softer and still very different. 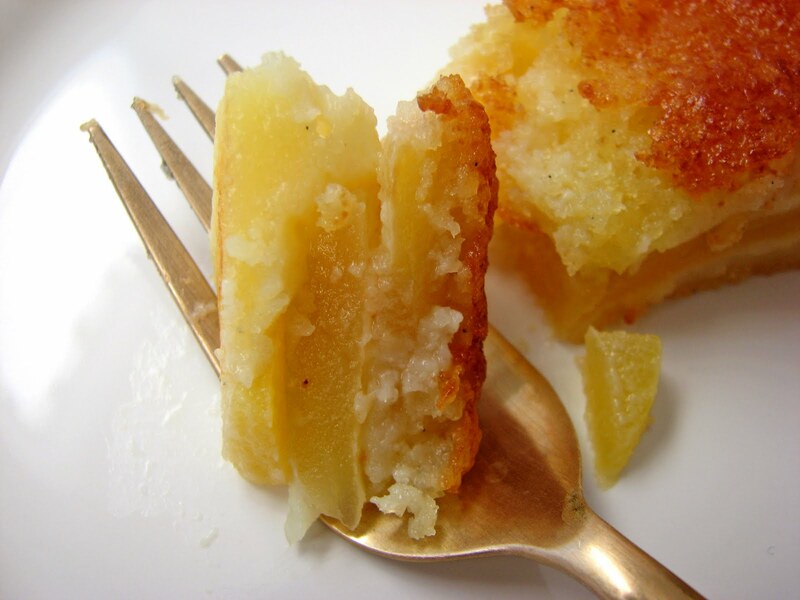 My version of this dessert has considerably less sugar, a pinch of salt, lemon juice and lemon zest. I’ve also revised the method a bit by infusing the melted butter with vanilla bean and changing up the baking temperature. If you love apples, this is a mother lode. The aroma emanating from the oven is the stuff of dreams. I promise. - I used Braeburn apples because I had several on my table that needed to be transformed. Granny Smith is recommended. Choose a favorite that is crisp and not too sweet. - The original recipe calls for 1 cup of sugar. I found that amount much too sweet for my taste. I’ve reduced the amount to 3/4 C and am even tempted to reduce it a bit further to about 1/2 C + 3 T, although Granny Smiths might mediate that. 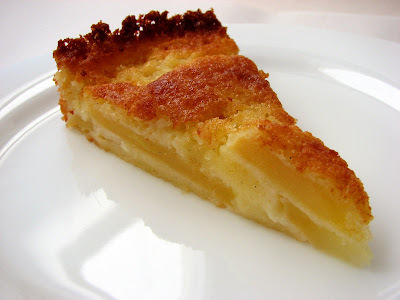 - I love the combination of apples, vanilla and lemon so I’ve replicated that delicious triad here. - The original recipe called for baking this at 375 degrees for 50 minutes. My oven runs hot so I bake this at 350 degrees for 25 minutes and then 375 for 25 minutes. I think that works out well because the higher temperature for the full baking time seems too high to bake this delicate pastry. Don’t be tempted to bake it longer than 50 minutes. Heat oven to 350 degrees. Prepare a 9” x 2 1/2” round cake pan with butter and flour and line with parchment. Grease and flour the parchment, tapping the pan to remove any excess. Melt the butter over low heat. Split the vanilla bean and scrape the seeds into the butter. Add the vanilla pod and keep on low heat for a couple of minutes, swirling gently. (The idea is to infuse the butter with the vanilla, not to brown the butter.) Take off the heat and set aside to cool. Place the lemon juice and lemon zest into a bowl big enough to hold the apple slices. Peel, quarter and core apples. Slice thinly and add to the bowl, tossing gently with the lemon juice and zest as you go. Set aside. Whip the eggs and the sugar until the mixture is light in color, thickened, tripled in volume and forms a ribbon when drizzled from the beater. This takes about 5 minutes on a stand mixer on medium high speed. Remove vanilla pod from the butter and gently fold the butter into sugar-egg mixture. Fold a third of the flour into the batter alternately with half of the milk, beginning and ending with the flour. Fold in the apples until every piece is coated with batter. Pour into the prepared pan and smooth out the batter and apples evenly. Bake for 25 minutes, then rotate the pan and raise the temperature to 375 degrees. Bake for another 25 minutes until the cake is golden brown. Cool on a rack for 30 minutes. Remove from the pan, gently remove the parchment and invert onto a serving platter. Savor with unbridled glee. With pumpkin season most definitely upon us, it’s hard not to let our thoughts drift directly to pumpkin pie, that all-American staple of the holidays. It’s impossible not to think about the months of October or November without thinking about all the glories of pumpkin and spice cradled in a crisp buttery pie crust. Holiday neurons are firing throughout the land. 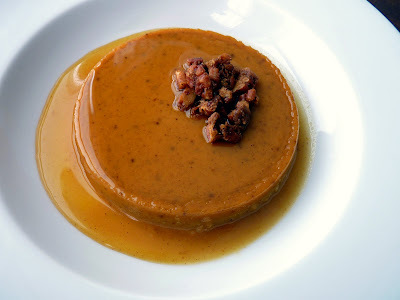 Before we get into the thick of November, I’ve strayed off the beaten path just a tiny bit to produce a Pumpkin Flan. This is still a custard, so I haven’t gotten too crazy. It’s a very rich and spicy flan bathed in a caramel infused with an acidic note of fresh orange juice. This is best served with a nice dollop of crème fraiche or sour cream, which gives it a bit of a creamy cheesecake twang. I also like garnishing it with pecans toasted in a butter and brown sugar glaze doused with cinnamon, chile and chipotle powders and salt. 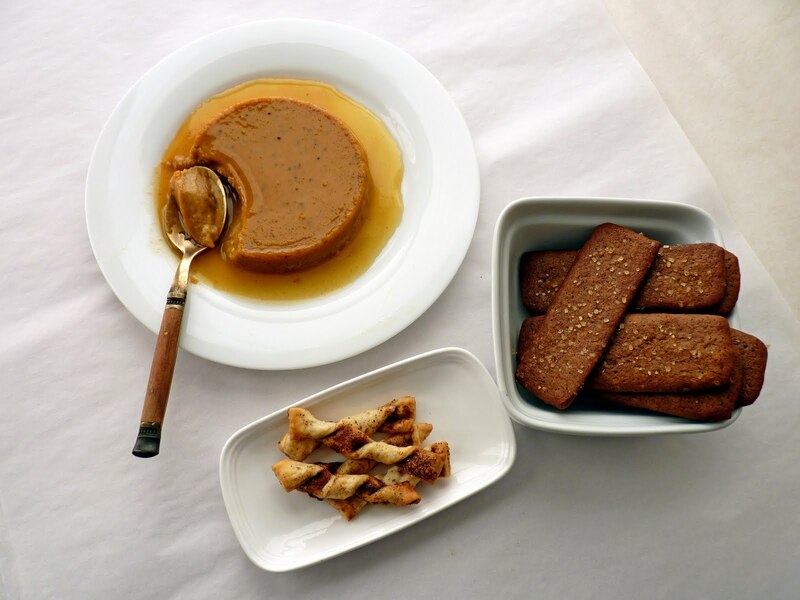 Or serve alongside some crisp ginger cookies or little pastry twists made from a some pie dough that has been sugared, dusted with cinnamon and cut into strips and twisted. There’s a bit of planning ahead required for this dessert. 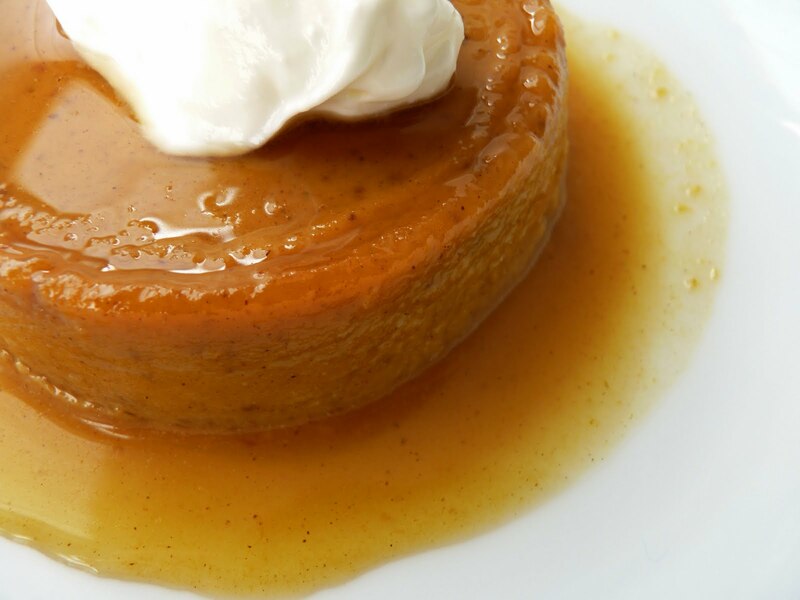 The baked flans rest overnight in the refrigerator to give the sugar in the caramel sauce a chance to liquefy, making them a breeze to unmold. The unmistakable taste of pumpkin is a sense memory of celebration we get to experience every single year and for that I give thanks. It's definitely time to fill your kitchen with the aromas and flavorful harvests of fall. - This is a very creamy and very loose flan. If you prefer one with a firmer texture, add another egg yolk. Keep your eye on the baking time. - Be sure you have all the ingredients for the caramel prepared and measured out because you’ll need to work fast once it turns the right color. I strained out the orange zest for the sake of the photos but you can leave it in for extra flavor if you wish. Be careful when you’re making the caramel and swirling it in the ramekins to avoid splashing it and burning yourself. 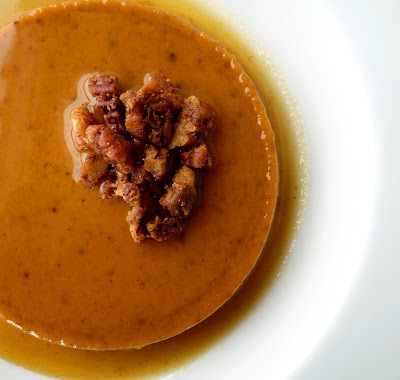 - The brown sugar adds a little butterscotch sensation to the flan. You can use white sugar if you prefer or a mix of the two. - Sometimes using a large roasting pan for a water bath can feel a little unwieldy. I use two smaller pans and fit 3 ramekins in each. This makes it a lot easier to remove from the oven. - This is a good time of the year to replenish your spices, brandy, rum, liqueurs, dried fruit and nuts. Be prepared for lots of fall and holiday baking! - If you love pumpkin, you might also enjoy Pumpkin Gingerbread Ice Cream. Set out six 3 1/2” or 4 1/2” diameter ramekins in a large roasting pan or baking dish. For the Orange Caramel, place the sugar and water in a saucepan on medium high heat. Cook the caramel until it is a medium dark amber. Take off the heat and wait a few seconds until it darkens a bit more on its own and starts to show some reddish tones. Set the pan down and carefully add the orange juice and zest. It will sputter vigorously. Let the caramel calm down and put back on low heat to melt any lumps, whisking gently. Once the sugar has smoothed out, take off the heat and add the Grand Marnier and a pinch of salt. Strain out orange zest if you prefer. Pour into the 6 ramekins to coat the bottom and swirl gently to coat the sides. The caramel does not have to go up the sides of the ramekin more than a just about a half inch. For the custard, mix the sugar, spices and salt together. Whisk the eggs until thoroughly combined. Stir in the pumpkin and the sugar mixture. Gradually add the cream and milk. Stir in the vanilla and rum. Pour into the ramekins. Slowly pour very hot water into the roasting pan until it reaches about half way up the side of the ramekins. Bake for about 45 – 50 minutes or until the edges are set and there is a bit of a jiggle in the middle about the size of a quarter. Gently remove from the oven. Take the ramekins out of the roasting pan and set aside to cool. Refrigerate overnight to ensure that the caramel stays liquefied. To serve, run a thin bladed knife around the circumference of the ramekin. Place a plate over the ramekin and invert. Dollop with crème fraiche or sour cream. 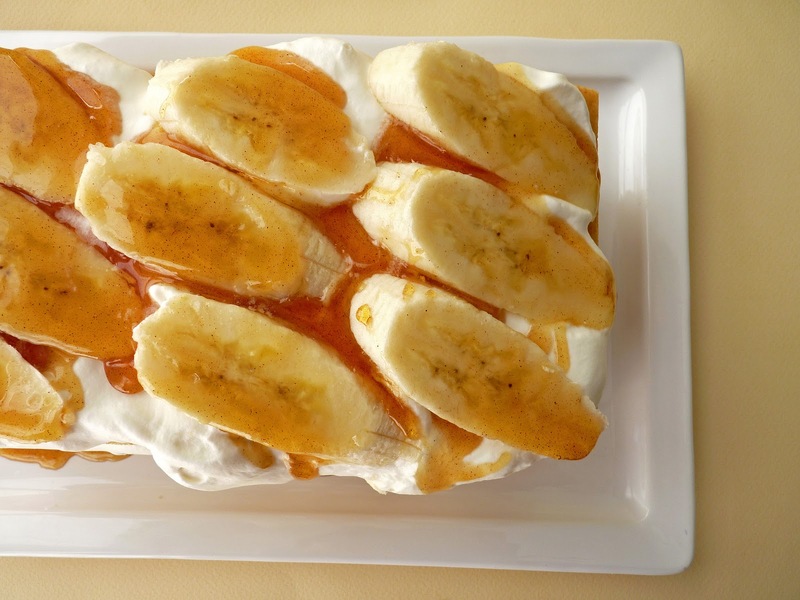 If you love bananas, this is the cake for you. It’s a bit of a messy cake, meant for people who like to make cakes but may not always have the time to fuss with frosting or buttercream or who simply prefer lighter and more rustic fare. There’s something so infinitely delicious about this easy compilation of light cake, fresh ripe bananas, spiced caramel syrup and slightly sweetened whipped cream that will more than satisfy any dessert dream. 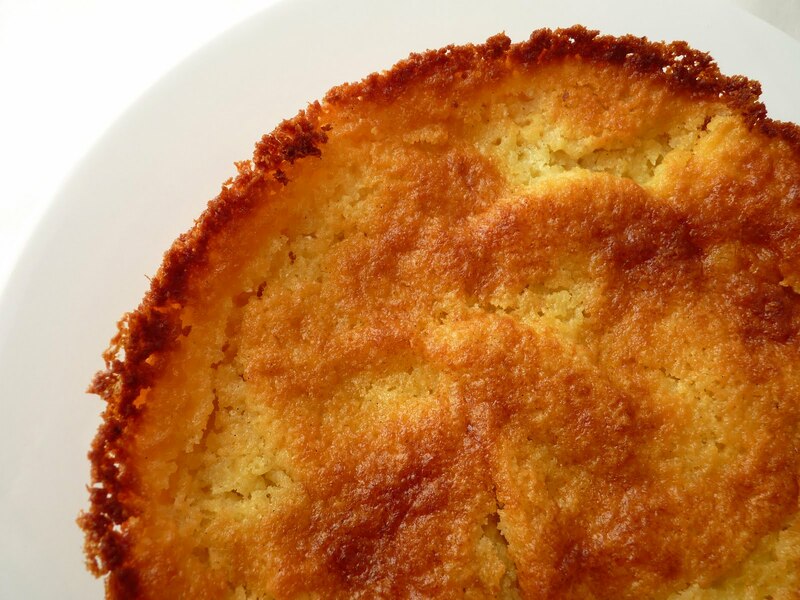 This super luxurious treat starts with a very basic tender and moist yogurt vanilla cake. Whipped cream with a little dash of rum is sandwiched between the layers to provide some silky deliciousness. And last but not at all least, a caramel charged with cinnamon and vanilla complements lots of fresh banana slices that add their own signature goodness to each bite. If you find yourself with a reason to celebrate and in need of a cake, it doesn't get any better than this very simple and terrific combination of flavors. Bring this cake to your table and enjoy the devouring of every morsel. Sheer banana bliss. - You can stage this preparation over a couple of days. The caramel syrup will keep stored in a glass container at room temperature for a couple of weeks. - You will probably have a bit of leftover caramel. You can spoon it over your favorite ice cream. - I use a 9" square metal cake pan. Glass conducts heat better than metal, so if you use a 9” square glass pan, check to see if the cake is done a few minutes earlier. - As always with caramel, give it your undivided attention. It will turn on you in a second! Try to take it to a medium dark amber color to avoid it being too sweet. Take it off the heat the moment it begins to reach the right color, swirl the pan a gently until it darkens a bit more and then quickly set the pan down and add the hot water to stop the cooking. And remember, whenever you add an ingredient to hot caramel, it’s going to bubble and splatter viciously. Just stand back and let it unwind. Adding a hot liquid helps to cut down on the reaction. Adding cold ingredients to hot caramel will likely cause it to seize on you. To fix a seized caramel, place it on low heat and whisk gently until dissolved, being careful not to splash any on your hands. - The rum in the whipped cream really adds a very delicious and subtle flavor to the whole cake without tasting of alcohol. For the cake, preheat the oven to 350 degrees. Grease a 9” x 9" x 2” square pan and line the bottom with parchment, leaving about a 2" overhang on two sides. This will help make it easier to remove the baked cake. Whip the whole egg, additional egg yolk and sugar until the mixture is thickened and tripled in volume. A ribbon tested on the surface should hold for at least a second. This takes about 5 minutes on a stand mixer on medium high speed. Add the vanilla and mix for another minute. Take off the mixer and fold in the yogurt. Sift a third of the flour into the mixture and fold gently. Continue with the remaining 2/3 of the flour and fold until there are no dry streaks. Fold in the oil and mix thoroughly. Pour the cake batter into the prepared cake pan and spread evenly. Bake for 25 – 28 minutes or until the cake is a light golden brown and springs back when lightly touched. Cool the cake on a wire rack for about 20 minutes. Gently lift the cake out of the pan using the parchment overhang to help loosen. The cake is tender so handle carefully. Leave it to cool completely. For the caramel, place 1/4 C water and 1 C sugar in a saucepan on medium high heat. Cook the sugar mixture just until it begins to turn a medium dark amber color. Watch it closely. Once the sugar starts to color it accelerates very quickly and will darken to a burnt and bitter stage very fast. If it's not coloring evenly, gently swirl the pan just a bit to circulate the darker areas. As it begins to approach the right color, take it off the heat and swirl the pan gently. Let it continue to darken a bit more with a slightly reddish cast. Once it looks like the right color, set the pan down, stand back and add the 1/2 C of hot water. It will bubble up vigorously and spatter, so be careful. When it settles down, return it to the heat and let it come to a boil. If there are any seized bits of caramel, whisk slowly until dissolved. Remove from heat and stir in the vanilla, cinnamon and lemon juice. Let it cool a few minutes and then add salt to taste. Pour into a bowl and set aside to cool. When ready to assemble, whip the heavy cream with the sugar and the rum until it holds a very soft peak. Store in the refrigerator until you’re ready to use. Slice the bananas on a long diagonal and toss with the lemon juice to prevent browning. To assemble, place the cake in parchment on a work surface. Using a serrated knife, trim all four edges of the cake, preserving its square shape. Cut the cake in half, gently lift it off the parchment and place on a serving platter. Dollop half the reserved whipped cream on top of the cake, then line with banana slices. 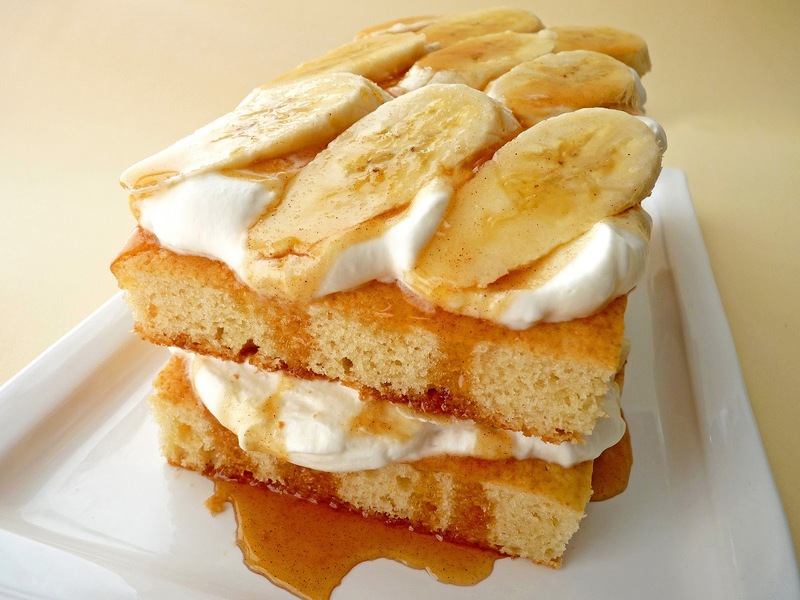 Drizzle the surface of the bananas with about 4 tablespoons of the caramel. 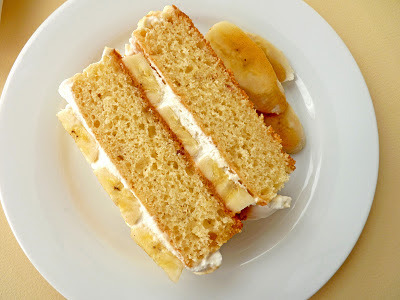 Place the other half of the cake on top of the bananas and press just a bit to secure. 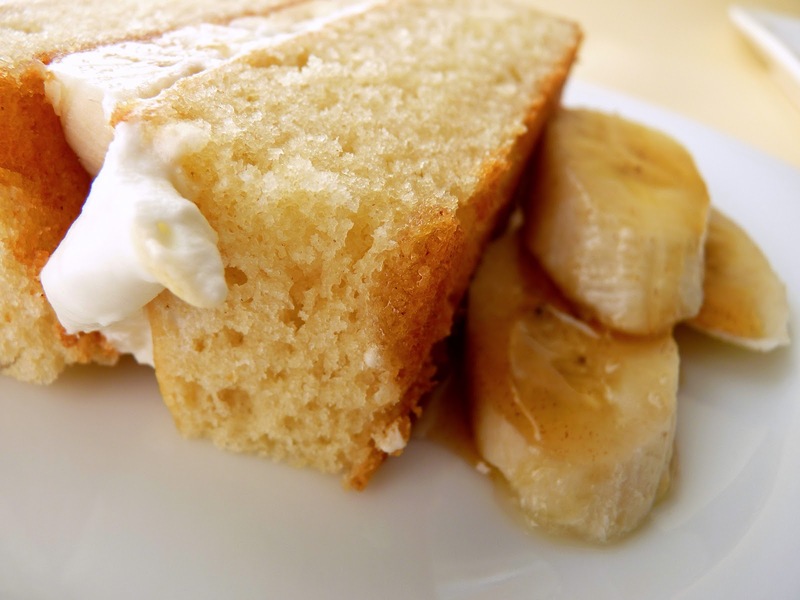 Dollop the remaining cream on top of the cake and line with bananas. Finish with another drizzle of caramel. Dot the remaining banana slices with a very light drizzle of caramel and add to each serving of cake. This is a glorified chocolate chip bar cookie chock full of toasted hazelnuts, dried apricots and crystallized ginger. There’s something about the co-mingling of all these elements that’s just so perfectly good. The apricots are a nice acidic foil for the sweetness and richness of the chocolate. The nuts provide another layer of texture and earthy flavor. The ginger perks up the whole mixture with bright spice and a very light note of heat. The result is a pastry that is moist and chewy with lots of gorgeous flavors dancing across your palate. 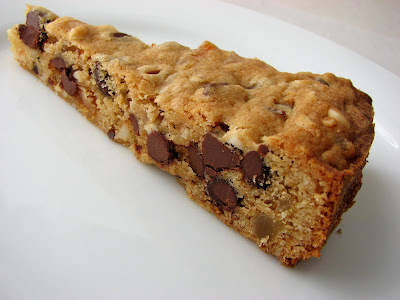 The idea for this recipe came from a delicious mendiant I made several Christmas seasons ago with these same chocolate, fruit and nut elements. I‘d been thinking about doing something more with that original flavor combination and I think it works out very well in this chunky configuration. Once you chop the fruit, ginger and nuts, this whole mixture comes together very quickly. 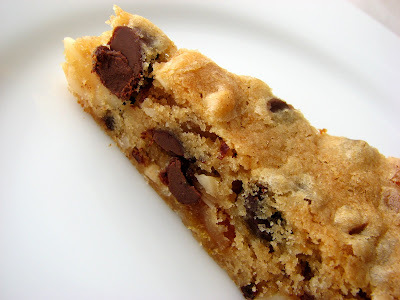 Part of the great appeal of bar cookies is that they don't require any scooping or rolling. The dough is baked into one large presentation and sliced into portions according to whim. As you stock your pantry with dried fruit and nuts for this baking season, consider this pastry. It would be great for a potluck or impromptu party, a certain little indulgent treat for your table to take off the chill of fall. - To toast hazelnuts, put them in a single layer on a baking sheet in a 350 degree oven for about 10 to 15 minutes or until lightly browned and the skins look cracked. Watch them carefully as hazelnuts can turn bitter if toasted too long. Remove from the oven and wrap the hazelnuts in a kitchen towel to let steam for 1 minute. Then rub them together to loosen and remove as much of the skin as possible. Cool completely. - A mendiant (“beggar” in French) is a simple confection that consists of small poured disks of chocolate topped with fruit and nuts. First made in the monasteries of France at Christmas, tradition originally dictated the use of almonds for the Carmelite order, hazelnuts for the Augustins, raisins for the Dominicans and dried figs for Franciscans. But now they are decorated with all sorts of other nuts, seeds and dried fruit, dictated only by personal preference. - You might also enjoy Oatmeal Shortbread and Italian Sbrisolona, absolutely fantastic cookies baked in a similar fashion. Preheat the oven to 350 degrees. Grease and line the bottom of a 9” springform pan with parchment paper. Coarsely chop the toasted hazelnuts and apricots. Finely chop the crystallized ginger. Cream the butter and brown sugar until thoroughly combined, about 2 -3 minutes. Scrape down the sides and bottom of the bowl. Add the egg and mix until fully incorporated. Mix in the vanilla. Add the dry ingredients and combine just until barely mixed and a few dry streaks remain. 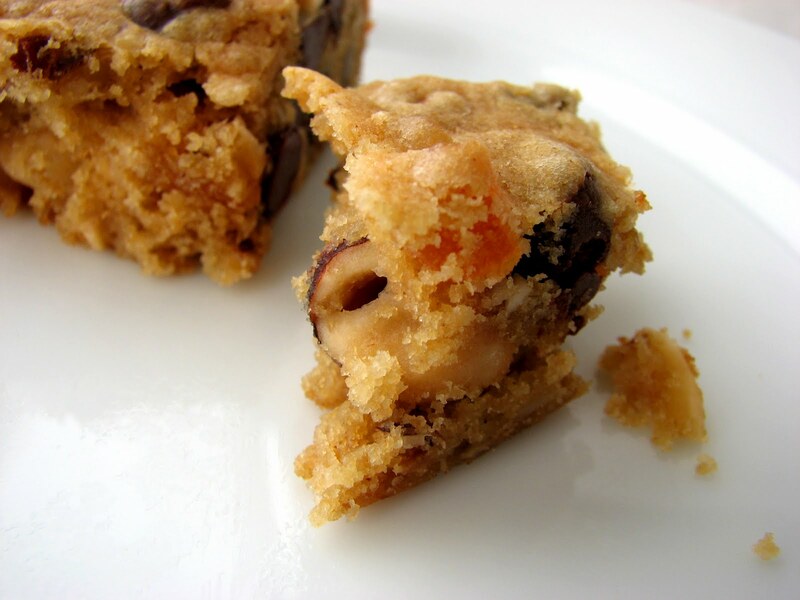 Fold in the chocolate chips, dried apricots, crystallized ginger and chopped hazelnuts until thoroughly combined. Scrape the batter into the prepared pan and spread into a smooth and even layer. Bake until slightly golden, about 22 - 24 minutes. Cool completely on a wire rack. Run a small spatula or a thin knife around the edge of the pan and release the springform ring. Use a platter to carefully invert the pastry and remove the bottom pan and the parchment paper. Invert again and transfer the pastry to a cutting board or a serving platter. There is something incredibly satisfying about the cool and refreshing taste of lime. I love everything in the citrus family and lime is one of the most assertive in terms of flavor and acidity, always delivering the best and sharpest pucker. Just when I thought it was time to prepare for the onset of autumn, along comes an extended heat wave. Temperatures in the 90s aren't part of the normal weather pattern in my city, so it wasn’t long before I was focused on making ice cream. In need of a super quencher, I headed straight for the citrus bowl. 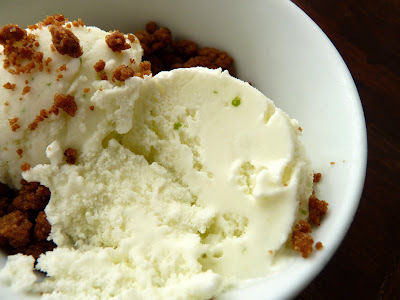 This tart and creamy ice cream goes very well with ginger cookies or ginger snaps. 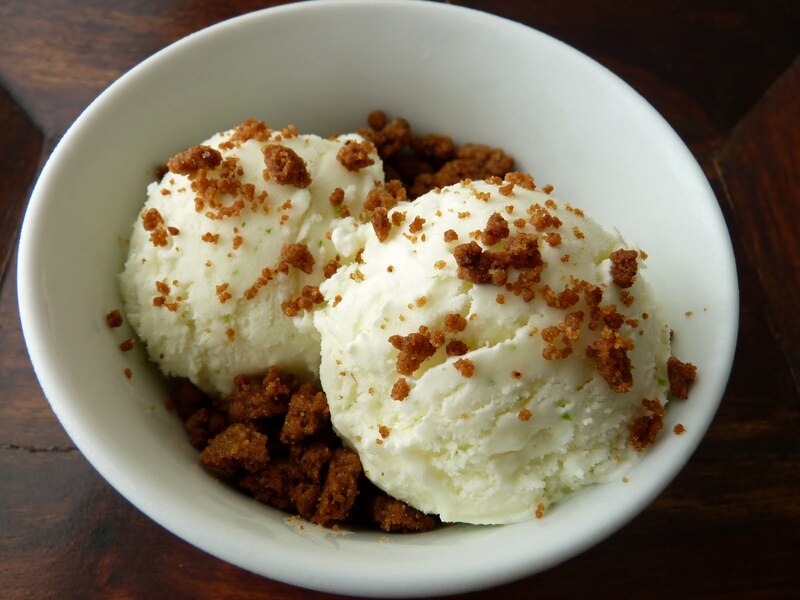 If you don’t want to bother making a whole batch of cookies or don’t have a favorite commercial brand, I include a recipe for a small batch of Ginger Crumble to complete the ensemble. It contrasts these great flavors perfectly and provides a little crunchy texture. Whatever the current weather pattern in your region, this ice cream is a very satisfying burst of freshness, even in autumn. - Processing the lime zest with the sugar releases the citrus oils and aroma. - Lime juice is harder to extract than lemon juice. If you don’t have a juicer or a press, a citrus reamer is a great tool. 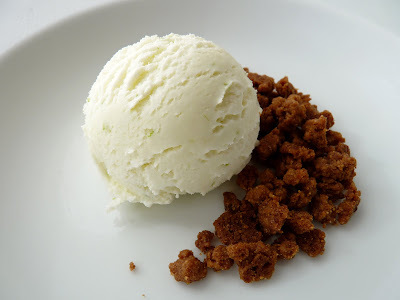 - Adding salt to ice cream is not to make it salty but to pique and enhance the flavors. - If you refrigerate the ice cream base overnight, the mixture will separate. Just give it a thorough stir before placing in your ice cream machine. - Add chopped almonds to the crumble for textural interest. 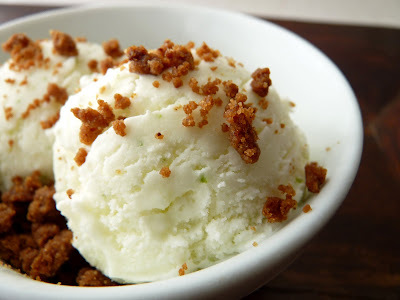 - I think this Lime Ice Cream would be hideously delicious with roasted pineapple or fresh mango or coconut cake. It would also make a great ice cream sandwich with Graham Crackers. To make the ice cream, combine the sugar and the lime zest in the bowl of a food processor and process until the zest is finely chopped and the sugar is a bit damp and aromatic. Add the lime juice, cream and milk and process together. Add salt to taste. Refrigerate until thoroughly chilled or overnight. Stir the mixture to thoroughly combine the ingredients. Freeze the ice cream according to your machine’s directions. Pour into a clean container. Press a piece of plastic wrap into the surface of the ice cream, cover and place in your freezer to firm up. For the Ginger Crumble, whisk together the flour, sugars, spices and salt until thoroughly combined. Place the butter pieces on top of the dry ingredients and drizzle the molasses over the butter. Toss the mixture to thoroughly coat the butter with flour. Rub the mixture together between the thumb and fingers of each hand until all the butter is worked into the dry ingredients and it resembles wet sand. Spread the mixture onto a baking sheet lined with parchment or a silpat. Chill for about an hour. Preheat the oven to 350 degrees. Bake the crumble for about 10 - 12 minutes or until the mixture looks like cookie crumbles. Check it carefully to be sure it doesn’t burn. Let it cool completely to set up. Break into small crumbles.